We just added over 600 new photographs including the works of two new Gango shutterbugs: Susann Parker (PSPKR) and Lee Peterson (PSPSN). Download our New Photosite Hotlist today. 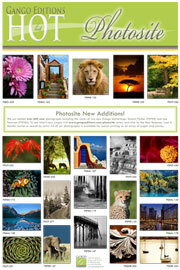 To see what’s new, simply visit www.gangoeditions.com/photosite, enter, and click on the New Releases ‘Last 3 Months’ button or search by artist. All of our photography is available for custom printing on an array of paper and canvas.